On October 14, 2016, we participated on the Hip-hop Workshop, held at the House of Culture Lúky, Bratislava. The hip-hop workshop was organized in order to test the youth-cultural training model in practice under Slovak conditions, which in many ways differs from those in Germany. The workshop took place on October 14th in the cultural center Lúky in Petržalka, one of the districts of Bratislava. This place was chosen mainly for symbolic reasons, since it is considered to be the “cradle” of Slovak hip-hop in the 90's. 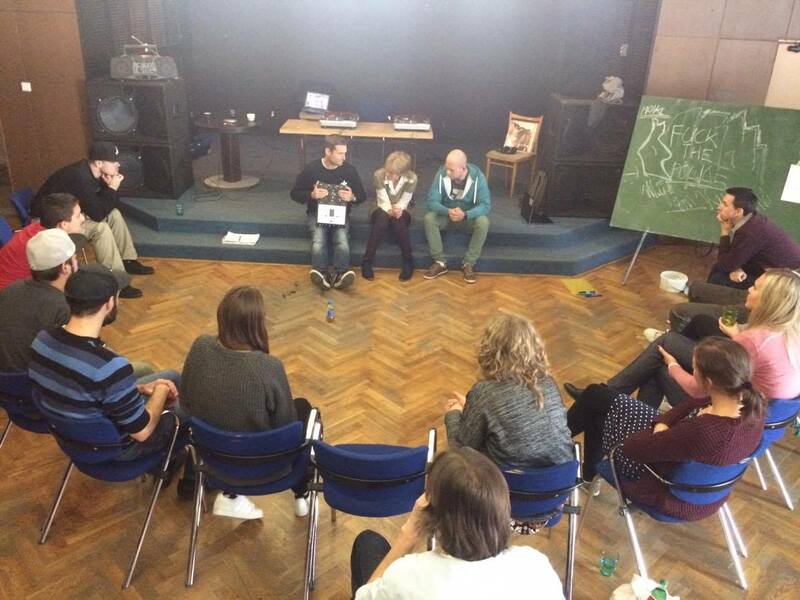 The workshop was led by the Slovak EFS trainer Michal Haman, a civic educator and member of the hip-hop community in Petržalka. Although originally planned as a workshop based on the “Train-the-Trainer” concept, the concept was partially changed considering the composition of participants who were attracted to the idea of the European Fair Skills youth cultural workshop concept. Its original aim was to target youth workers from Bratislava and its surrounding areas who would be interested to see how hip- hop and DJs could be used as a part of civic education. The resulting group was, however, consisting almost predominantly of young hip-hop artists from Petržalka, i.e. young people who are not really interested or trained in the field of civic education, but who at the same time have some impact on youngsters via their music and awareness raising about political facts. This makes them a very specific target group with a significant potential for youth work. The one-day event consisted of two main parts. After a series of “ice-breakers” and introductory games, the first part of the workshop was comprised of a session focusing on the methods of conducting civic education via hip-hop-related topics such as famous artists, songs or albums from both the Slovak and international music scene. Considering the composition of participants who themselves are significantly knowledgeable about hip-hop history and the meaning of the songs, the discussion as well as the interconnections with the topic of civic education became even more interesting. Following this session, the second part covered an even more important topic, namely the opportunities that young artists have in approaching young people and delivering important messages to them. The end of the workshop was dedicated to the youth cultural part of the EFS workshops, i.e. a competition to build a DJ controller, the school of scratch and a hip-hop battle. At the end of the day, participants performed some of their songs during a concert on the premises of the cultural center, which was open to the public and thus had an immediate local dissemination effect.